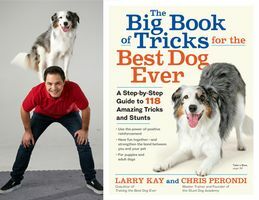 Left Bank Books welcomes stunt dog trainer Chris Perondi (and cover dog Vinny Valentino) for a signing and discussion of his new book, "The Big Book of Tricks for the Best Dog Ever: A Step-by-Step Guide to 118 Amazing Tricks and Stunts," and a performance and tutorial by Vinny! Your purchase of "The Big Book of Tricks for the Best Dog Ever" from Left Bank Books will grant you entry into a raffle to win a personal 30-minute Skype coaching session with Chris on training your own dog! "The Big Book of Tricks for the Best Dog Ever" is a step-by-step guide to more than 100 dog tricks, specially designed for effective training, for pure fun, and even for turning your dog into a YouTube star, from Chris Perondi, the co-author of the tremendously successful and much-praised "Training the Best Dog Ever" and the genius behind "The Stunt Dog Show," which performs more than 1,000 shows a year and has been featured on The Today Show, The Ellen DeGeneres Show, The Oprah Winfrey Show, The Tonight Show with Jay Leno, and more! This event is free and open to the public, but proof of purchase of "The Big Book of Tricks for the Best Dog Ever" from Left Bank Books will be required to enter the signing line.